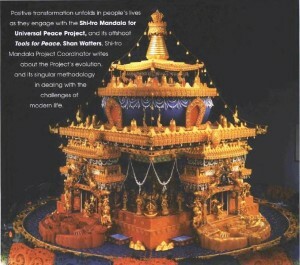 Positive transformation unfolds in people’s lives as they engage with the Shi-tro Mandala for Universal Peace Project, and its offshoot Tools for Peace. Shan Watters, Shi-tro Mandala Project Coordinator writes about the Project’s evolution, and its singular methodology in dealing with the challenges of modern life. “I wanted to see what it felt like to kill someone,” says a fifteen-year old boy, when asked at a recent Tools for Peace workshop why he was incarcerated at juvenile detention facility, Camp Scudder. We hear things, working with youth in these environments, which we would never have dreamed existed in the minds of children. Our hearts break and our minds reach to teachings on patience and non-judgment. When they begin to recognize their own inherent goodness, it is a joy to witness! The young man mentioned above is now writing a book about his life. He is taking responsibility for his actions. The regret he now feels is painful. This change of heart he attributes to methods garnered from the workshop.